Alexandria Ocasio-Cortez's path to Congress representing an urban, diverse district in New York City began in a freezing-cold protest camp in North Dakota. She spent several weeks in 2017 with indigenous activists fighting the construction of the Dakota Access pipeline near the Standing Rock Indian Reservation. The protests garnered national attention, even if she herself didn't. "It was right after I left Standing Rock that I knew I had to do something," she said at a press conference last week. That something turned out to be a primary challenge to Rep. Joe Crowley of New York, one of the most powerful Democratic members of the House. A bartender at the time, Ocasio-Cortez ran an energetic, proudly leftist campaign, rallying young voters to her cause. The win catapulted her onto the national scene. 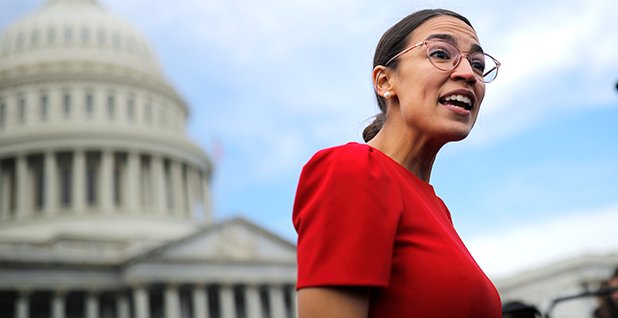 Most of the media attention focused on her youth — at 29, she is the youngest woman ever elected to the House — and her political leanings as a member of the Democratic Socialists of America. But her actions in North Dakota weren't lost on climate activists. "She was someone who was very passionate about climate justice," said Evan Weber, Sunrise Movement founder, who noted her time at Standing Rock. Sunrise had its eye on Ocasio-Cortez as a climate champion back when it endorsed her primary candidacy. At the time she was a massive underdog, and the group wasn't on anyone's radar as a player in the climate debate. That all changed on Election Day. Ocasio-Cortez often links her experiences with the water protectors at Standing Rock and the goals of the Green New Deal. In North Dakota, she saw corporate power bearing down on the Native activists, building a pipeline that would endanger local water and ultimately contribute to greenhouse gas emissions. "They're protecting their water, they're protecting their air and they're asking for the right to live," she said Friday. She often frames climate change in these existential terms. "Our government and our elected officials need to drink our water and breathe our air because our lives are on the line," she said, later adding that corporations and the fossil fuel industry need to be confronted because "people will die and people are dying." On Nov. 13, Ocasio-Cortez joined 150 activists from Sunrise in a protest at the office of House Minority Leader Nancy Pelosi (D-Calif.), the likely next speaker. Sunrise wants a Green New Deal: a program aimed at decarbonizing the U.S. economy through significant investments in green infrastructure and renewable energy. It also wants the establishment of a select panel on climate change with legislative authority in the House. Ocasio-Cortez quickly signed on to the group's goals, boosting them on Twitter and turning what had been fringe proposals into a legitimate movement among the party's progressive flank. At least 18 members of the new Democratic caucus back the Green New Deal. "Obviously we had added star power and firepower that took it through the roof," Weber said regarding the explosion of interest in the Green New Deal after Ocasio-Cortez trumpeted the cause. 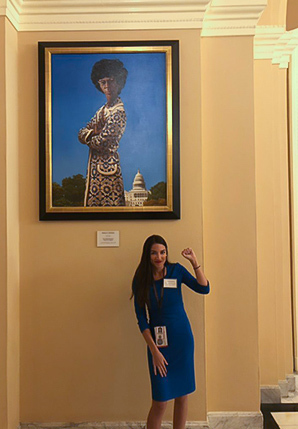 She has since been joined by other progressive favorites including Reps.-elect Ilhan Omar of Minnesota, Ayanna Pressley of Massachusetts and Rashida Tlaib of Michigan. Ocasio-Cortez's solutions to the climate crisis — heavy government subsidies to green industries that will create jobs, taking power from corporations and anti-poverty measures — fit into the broader progressive program of which she is a prominent figure. Other policies include free public college education, a federal jobs program — emphasizing green jobs — with a $15 minimum wage, universal Medicare, a jobs guarantee program, and eliminating Immigration and Customs Enforcement. "We can use the transition to 100 percent renewable energy as the vehicle to establish economic, racial and social justice in America," she said at a televised event with Sen. Bernie Sanders (I-Vt.) on Monday. "That is our proposal and that is what we are here to do." Whatever happens with the Green New Deal, Ocasio-Cortez's climate focus is not going anywhere. 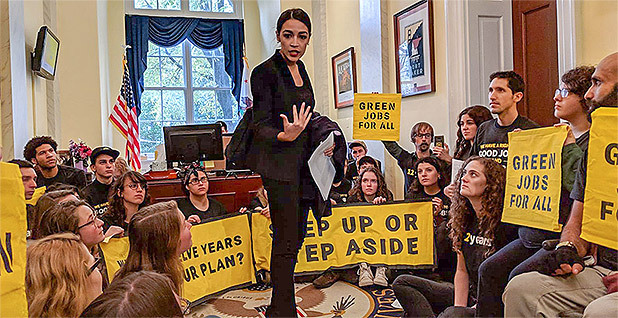 She has signaled an interest in sitting on the Energy and Commerce Committee and told reporters that regardless of whether the select climate committee gets legislating power, the Democratic House needs to have the Green New Deal legislation ready for 2020 (Greenwire, Nov. 30). Rallying with the Sunrise Movement last week, she placed the impetus for confronting climate change on politicians who need to find the "courage" to act. "The question of whether we are going to save ourselves is not a logistical question," she said, "it's a political question."